Enjoy an 18-hole round of golf―complete with club hire―at Ireland's scenic Castle Barna Golf Club. 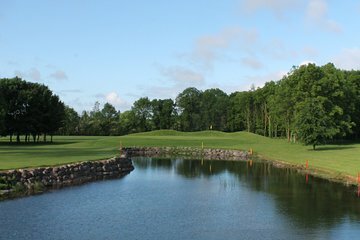 Located along the Grand Canal an easy hour drive from Dublin, the par 72 Parkland course features rolling terrain, winding streams and plenty of mature trees―challenging golfers of all skill levels. Work up your nerves for 'The Barge,' the signature 9th-hole that requires a short, straight shoot to even come close to its par 3. Castle Barna also has a casual old stone bar and restaurant for unwinding after the game.